AMMAN, Jordan — When the Arab Spring reached Jordan last year, a newspaper columnist, Muwafaq Mahadin, was one of the first to march with protesters demanding reforms in his country. He also backed Syrian demonstrators who began taking to the streets in March 2011. But a few months later, he made an about-face, aligning with the regime of President Bashar al-Assad. Like many other Arab intellectuals, he says he did so out of fear for the future of the region. 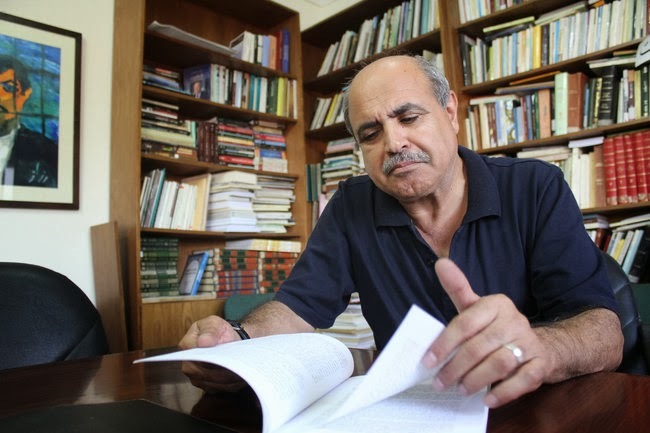 Mr. Mahadin, a prominent opposition figure who writes for the independent Jordanian daily Al-Arab Al-Yawm, has extensive pro-democracy credentials. He was arrested several times for his political views and was even forced to flee the country for a decade, living in exile between Beirut and Damascus. Mr. Mahadin is just one of a number of leftist, anti-imperialist intellectuals who believe that the Syrian rebellion is being led by Islamists aligned with the West, manipulated by Ggulf states including Qatar and Saudi Arabia on the behalf of the United States and Israel, in order to gain dominance in the region. “We particularly appreciate the perseverance of the Syrian leadership in keeping the pace of reforms and adhering to dialogue despite mounting terrorist acts against Syria — despite the inflammatory media campaigns by Qatar, Saudi Arabia and the West, and despite interventions that are contrary to international law — evidenced by the smuggling of money and various weapons into Syria,” the statement read. Mr. Mahadin says that the conflict taking place in Syria echoes the Cold War, with rebels being funded and armed — just as Islamist mujahedin fighters were — by the West to fight Soviet control of Afghanistan during the 1980s. Mr. Mahadin traveled to Syria last year on a special visit to express solidarity with the Assad regime and wrote a series of columns accusing the international media of lying about what was transpiring there. According to François Burgat, a senior research fellow specializing in Middle Eastern Politics at the French National Center for Scientific Research, Mr. Mahadin’s analysis of the Syrian conflict understates the strength of the popular revolt while overstating international influences. Mr. Burgat believes that leftist intellectuals, who support Mr. Assad, are giving in to an old Arab temptation of preferring to retain an authoritarian regime rather than risking increasing Islamist influence in a new government as has happened in Egypt, Libya and Tunisia. These conflicting viewpoints on Syria have buffeted the pro-democracy efforts in Jordan, creating a division within the opposition movement there, according to Lamis Andoni, another prominent Jordanian columnist, who is of Palestinian descent. Ms. Andoni says that while there are legitimate concerns over the impact on the wider region should the Assad government fall, this cannot justify support for a regime that kills civilians. “Many people have supported the Syrian regime because of its important role in the region in countering Israeli expansionism,” she said. Mr. Mahadin is not alone. Joseph Massad, who teaches modern Arab politics and intellectual history at Columbia University in New York argues that throwing out a dictator with the help of foreign allies is always a bad idea. Ziad Majed, a professor of Middle East Studies at the American University of Paris, says that it is legitimate for Syrians to aspire to end a regime that has governed brutally for more than four decades. Meanwhile, Syrian refugees, who have fled the fighting in their homeland, want whatever help they can get. When Foreign Minister Laurent Fabius of France visited Al Zaatari camp in northern Jordan, at the Syrian border, in mid-August, refugees held a protest asking France to come to the rescue of Syrian civilians. Read the story on the New York Times' website.